You know the typical items you should stockpile in case of a sudden, long-term survival situation. You have water, food, batteries, candles, medical supplies, and all the necessities which may be needed in cases of mass-disaster or financial crisis. You’ve stockpiled weapons, have a garden and extra seeds, and have learned how to make a snare for trapping small animals. Inevitably, you’re going to discover that you forgot something that is currently really easy to come by, but during a future crisis, may be impossible to get or ridiculously expensive. This list includes some of these items, which even if you don’t need or use them, will come in handy to trade for items you do need. – Baby supplies: Pacifiers, cloth diapers, safety pins, and infant clothes will all come in handy even if you do not have an infant. If you have older children, in the future, they may have children, and you will be the best grandparent in the world if you have a clean, unopened package of pacifiers or a stack of cloth diapers with safety pins. – Mouse traps: If a natural or financial crisis occurs, the cities will quickly be overrun with rodents, and the price of a good mousetrap will skyrocket. Whether you are trying to protect your own rations from the scurrying creatures or trading for fresh eggs, you’ll be happy to have stored some of these. – Fly swatters: Flying pests will likely multiply as well. – Empty containers: Food grade containers have a plethora of uses, particularly resealable items, such as plastic pop bottles, baby food jars, mayonnaise jars, and any other reusable container. When purchasing consumable goods, consider the future use of the case in which it is sold. Remember to thoroughly wash all vessels to prevent the growth of mold or bacteria. – Clothes pins and rope: If you are without electricity, you will undoubtedly be hanging your clean clothes to dry in the sun. While you can always improvise, why should you have to? A clean rope will be a sturdy place to hang your clothes and clothes pins will prevent your clothes from blowing off in a stiff breeze. – A meat grinder: Some wild game can be tough to chew, so you’ll find that a hand-operated meat grinder will allow you to easily chop it for cooking and digestion. 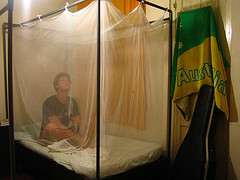 – Mosquito netting: Whether you want to rig a hat net for gardening or a large tent to place over your eating area, mosquito netting is ideal for protecting you from flying, biting bugs. A bankrupt state will be no walk in the park.